Some times back I had made a post about two abandoned bridges which led to nowhere. Today I present another bridge, which unlike the above referred two bridges, is a regular well travelled bridge. However the design of this bridge is such that, most of the travellers specially the first time travellers driving on the bridge, get a scary sense that the bridge goes nowhere and if they proceed further they will drop in the abyss below. The bridge known as 'Storseisundet Bridge' is part of the one of the most scenic road in the Norway; The Atlantic Road (Atlanterhavsveien) which connects the Norway's mainland to the Island of Averøy. 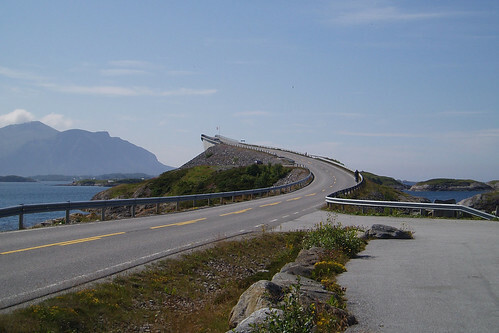 Opened in 1989, the 8.3 km (~5 mile) long road has eight bridges inter-connecting several small islands in the open sea near the coast. 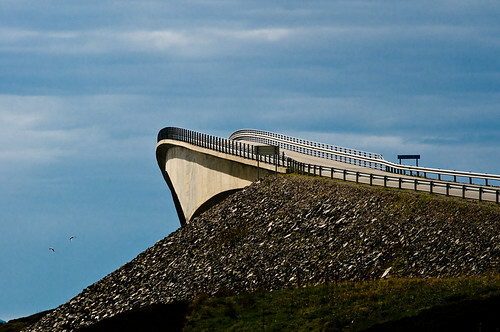 The 260 metre long cantilevered 'Storseisundet Bridge' is the longest and most spectacular bridge on this scenic route. 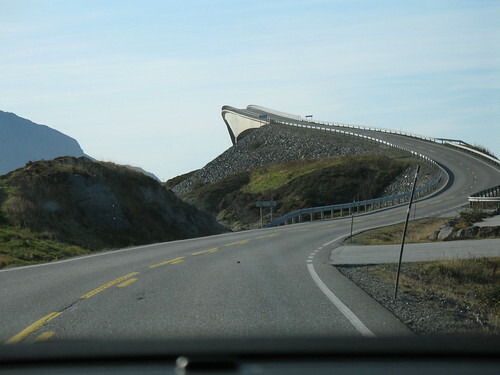 Its high gradient with a sharp turn has made it a popular tourist attraction. As a matter of fact the entire route with many sharp turns along with natural rocky scene and rough sea have ranked the route as first in The Guardian's 2006 List of the world's best road trips. 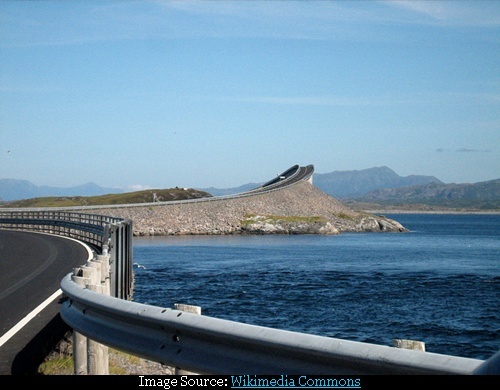 In 2005 the road was declared as the winner of "The 20th century's building project" in Norway. Reportedly the best time to travel on the road is during the stormy weather. 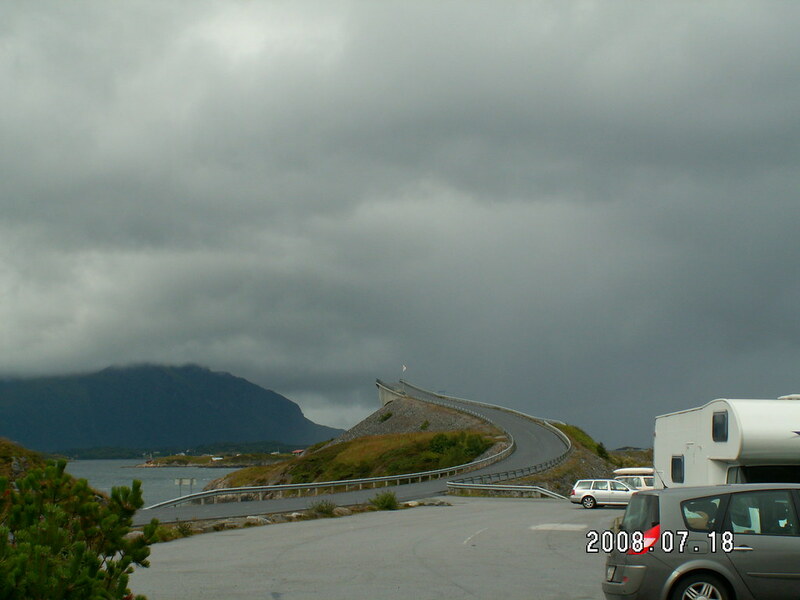 Credits: Moaguten whose post entitled "The Atlantic Ocean Road" in Google Earth Community brought this to my knowledge.